The U.S. Army School of Music Woodwind Quintet will perform a recital at 6 p.m. Monday, Jan. 28, in Cole Concert Hall on the SFA campus. NACOGDOCHES, Texas - The Stephen F. Austin State University School of Music and its Friends of Music Concert Series will present the U.S. Army School of Music Woodwind Quintet in a recital at 6 p.m. Monday, Jan. 28, in Cole Concert Hall on the SFA campus. The program contains works arranged for the SFA performance and classic woodwind quintet pieces, according to Lee Goodhew, associate professor of bassoon at SFA. 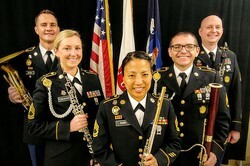 The U.S. Army School of Music Woodwind Quintet consists of instructors from the U.S. Army School of Music, located at Joint Expeditionary Base Little Creek - Fort Story in Virginia Beach, Virginia. Selected from within the ranks of Army Music, they provide instruction to all newly enlisted soldiers of the Army Music Program, as well as continuing education to non-commissioned officers and officers returning to the School of Music for professional development. As Army musicians, they have performed for and entertained military and civilian audiences throughout the United States and around the world, including locations such as Germany, Russia, Israel and Iraq. The quintet includes Sgt. 1st Class Alice Park, flute; Sgt. 1st Class Kailin Eskander, oboe and English horn; Sgt. 1st Class Charlie Brokovich, clarinet; Staff Sgt. Derek Bannasch, bassoon; and Sgt. Andrew Moon, horn. The program features "Summertime" by George Gershwin, arranged for the U.S. Army School of Music Woodwind Quintet by Spec. Aaron Mulder; Libertango" by Astor Piazzolla, arranged for the U.S. Army School of Music Woodwind Quintet by Sgt. 1st Class Charlie Brokovich; and "Quintet" by Carl Nielsen, among other works. Featured in Gershwin's opera "Porgy and Bess," "Summertime" is considered one of the composer's greatest compositions, and a definitive American aria, according to Staff Sgt. Bannasch. "It was arranged for the quintet by one of our former students, Spec. Aaron Mulder, a 2017 graduate of the U.S. Army School of Music's Basic Music Course, who currently serves as a saxophonist with the 484th Army Band in Milwaukee, Wisconsin," Bannasch said. Piazzolla's music has become popular for woodwind musicians who want to expand beyond the traditional repertoire and delve into new styles, Bannasch said. His "Libertango" was originally written for traditional Argentine tango instrumentation, but has been adapted for nearly every variety and combination of instruments and singers. Consisting of four movements, roughly echoing the form of a symphony, Nielsen's "Quintet" is widely considered the seminal masterwork for woodwind quintet. Staff Sgt. Daniel McBride, who is the Army music auditions coordinator for Texas, will accompany the quintet. He will be available before and after the performance to speak with students about career opportunities and auditions for Army Music.